When more than 40 attorneys, Keating Muething & Klekamp PLL (KMK) partners, associates and in-house counsel came together to coach, judge and mentor 34 diverse 1L law students, the nation’s first and only law student diversity case competition was born. Held in the KMK law office in downtown Cincinnati Jan. 18-19, the University of Cincinnati College of Law's Center for Professional Development and KMK partnered together to offer this unique opportunity. The students had less than 24 hours to solve real-life based client scenarios. 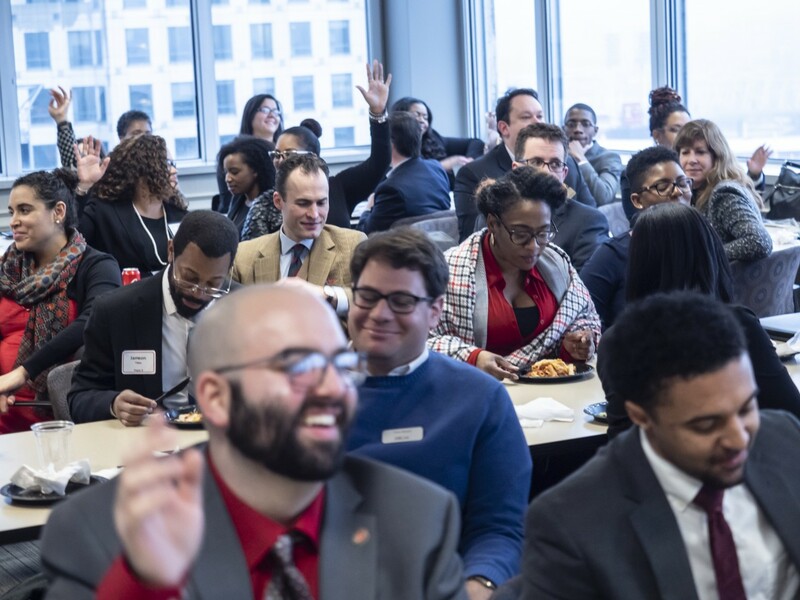 This show-and-tell event allowed diverse students to demonstrate the skills necessary to succeed in a law firm setting, a place where diversity is stagnant at best. According to National Association for Law Placement’s 2018 Report on Diversity in U.S. Law Firms, while there are overall gains in the representation of women, minorities, and LGBT lawyers, the representation of African-American associates remains below 2009 numbers. 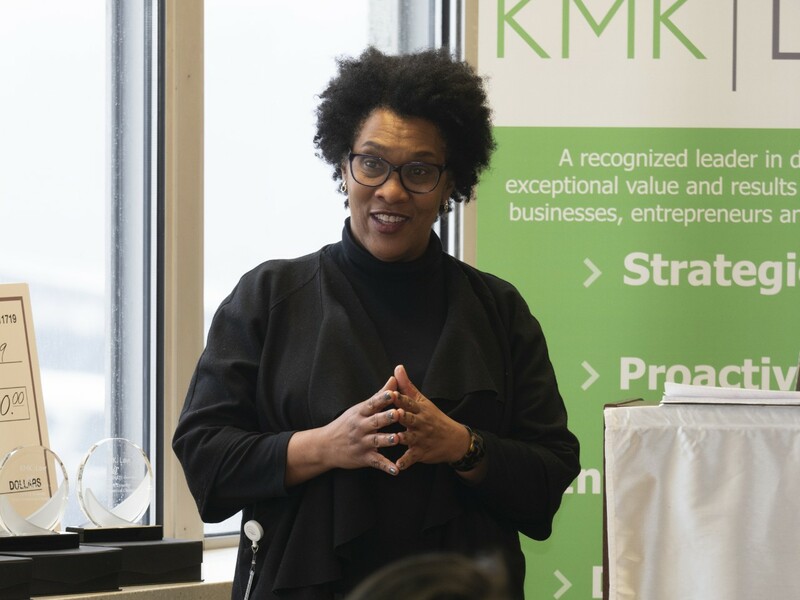 At a time when the legal profession once again laments the lack of diversity and 170 general counsels pledge to only use law firms that promote diversity, KMK is a law firm doing it in an innovative way – enter Cincinnati Law. The university's cutting-edge strategic direction, Next Lives Here, calls for innovative programs like the law competition and community partnerships to promote an inclusive culture in the world. Mina Jones Jefferson, associate dean, chief of staff, and director of the Center for Professional Development at Cincinnati Law. When Mina Jones Jefferson, associate dean, chief of staff, and director of the Center for Professional Development at Cincinnati Law, began piecing together opportunities for law students, she recognized that the traditional career fair model was outdated and not the best predictor of success. A case competition where students could showcase their legal skills would be ideal. The public-private partnership with KMK leveraged resources and inclination. 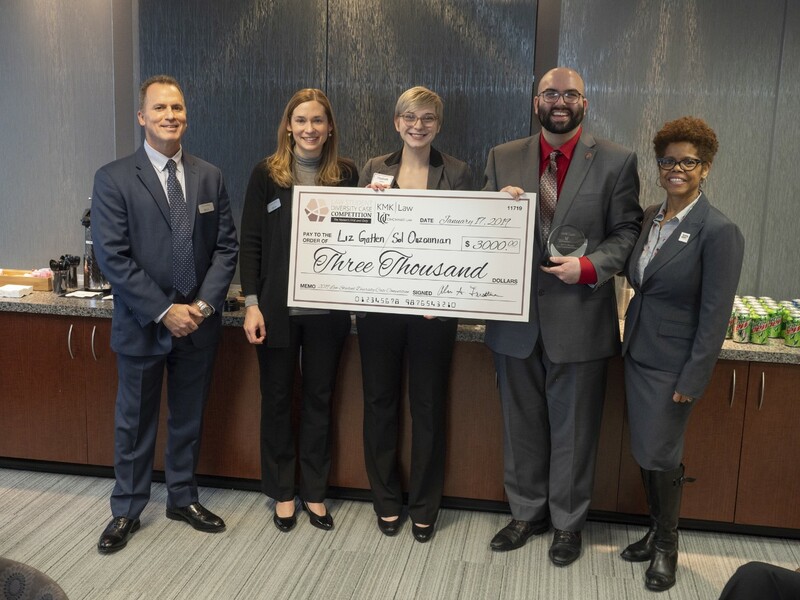 At the January 2019 competition, 34 diverse students from seven tri-state law schools competed, gaining hands-on legal experience and demonstrating what they can do. They also created invaluable professional connections that they may not have had the opportunity to do elsewhere. Not to mention cash awards provided by KMK. Teams were comprised of students from the University of Kentucky College of Law, Chase College of Law (Northern Kentucky University), Moritz College of Law (Ohio State University), Cleveland-Marshall College of Law, Maurer School of Law (Indiana University), McKinney School of Law (Indiana University) and Cincinnati Law. Student participants meet with coaches. Myles Chaney, Jonas Bastien and Erik Mcarley, students from the University of Kentucky College of Law, joked that they enjoyed the competition so much, they’re going to re-register as first year law students so they can come back next year. Joel Chanvisanuruk, Cincinnati Law’s assistant dean and director of Academic Success and a nationally known bar prep expert, spearheaded the creation of the two assignments for the competition. The scenarios spotlighted labor and employment law, business law, corporate law, as well as the day-to-day functions of a lawyer in the field. Students were given the cases and, working with their coaches, had under one hour to prepare before meeting with a KMK partner to receive additional information about the assignment. As the competition unfolded, participants were thrown a curve ball immediately before round two, which occurs often in the real world. The Honorable Judge Timothy S. Black, U.S. District Court Judge for the Southern District of Ohio, chats with student participants. Judges for the event volunteered more than just their time, but also their insight and legal expertise. The competition included a professional development panel comprised of in-house attorneys from across the tri-state region with a variety of backgrounds and experiences. Anitra Walden-Jacobs, a labor and employment attorney for Speedway LLC and Cincinnati Law alumni, shared how impressed she was with the first-year law students and that the entire experience was invaluable for both employer and employee. “One of the biggest complaints from partners at law firms,” she noted, “is that students come to work, and they don’t understand what they need to do.” This competition was a way to begin addressing that problem. 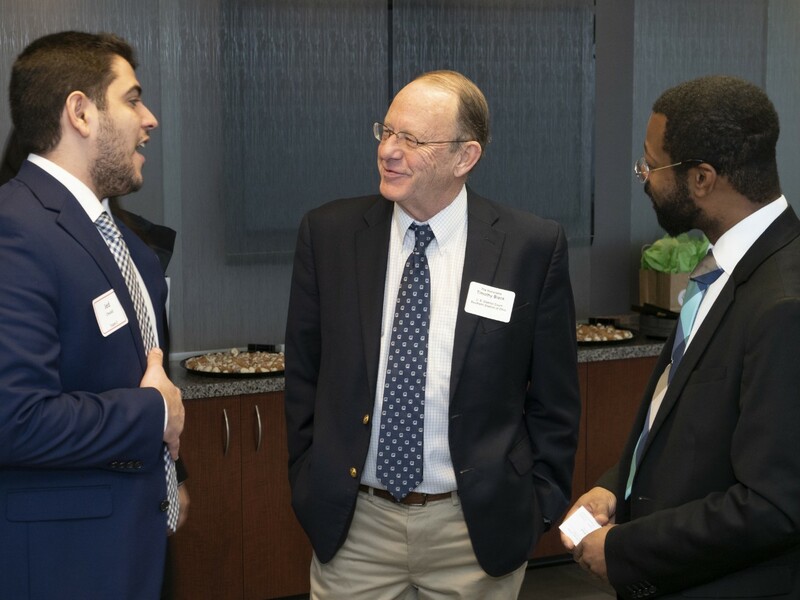 The case competition also brought an opportunity to reconnect with former classmates and help enlighten and coach the next generation of attorneys. 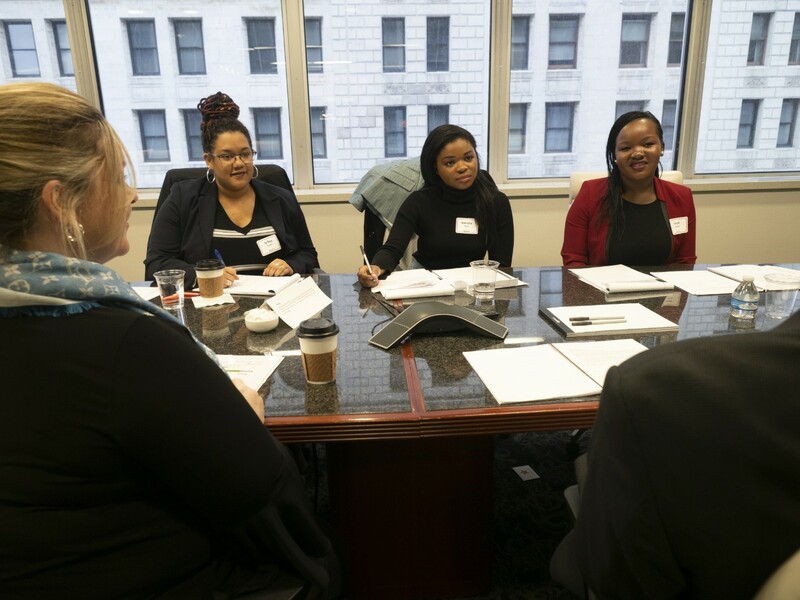 Shelly Kendricks-Buford, corporate counsel at Fujitec America, Inc., said that this was her “first time working with students this early into law school,” and that this kind of exposure usually only comes in the upper level courses. After a panel of speakers answered student’s questions about life after law school, the winners were announced and prizes awarded. First place winners, Elizabeth Gatten and Sol Ouzounian, from Cincinnati Law. Second place was awarded to Kanisa Ervin, Sarah Ochieng and Ja'Nae Powell, also from Cincinnati Law; third place was awarded to Zeynep Kart, Thomas Pope and Keri Richardson from Moritz College of Law. Sometimes practicing a scenario before the stakes are high can generate the confidence to perform successfully in the real-world and provide law firms a different set of metrics to use when hiring. The case law competition did just this. By providing diverse talent the opportunity to showcase their legal abilities and sharpen their professional skills, both employer and employee benefit. Cincinnati Law and KMK may have just changed the way law firms identify and hire diverse talent for summer jobs. In fact, several interviews have occurred since the competition and other law schools are inquiring about bringing the competition to their campus.